When I was a little girl, there were none of those chocolate-filled advent calenders. The ones sealed with tin foil and suitable for one-use only. Well, perhaps there were, but my Mum never bought me one. Instead, every year I got a different advent calendar from a local shop. At the end of Christmas I folded all the doors down, and stacked big heavy books on top, so that next advent I could bring out all of the calendars and open them every morning. I'm a bit disillusioned with the modern trend of buying the chocolate ones and throwing them away. So, if you are also feeling that we live in a world too quick to buy and discard, then here are some ideas on how to reinvent calendars and enjoy them again. I'm publishing well in advance of December, because some of these might take a bit of time to make. You Are My Fave is a brilliant blog, which is always full of quirky and unusual ideas for any occasion. They have a great series of "..In a Box" ideas, where the author puts together a lot of little toys, art, decorations and food into an egg-box related to a holiday or current event and declares "Thanksgiving in a box is my fave". 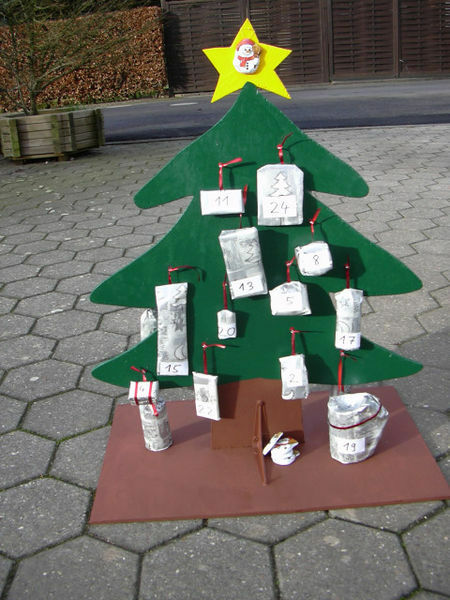 I always check the site when I'm looking for inspiration, and this year I was excited to see a fun advent calendar. You create 25 round holes in a large card, with paper glued to the back of it, so you can punch through. Sounds like 25 days of great stress-relief! You can find the full instructions on the You Are My Fave blog here. If you like the idea of a chocolate treat every day, then you could make the chocolates yourself. I have a bit of a thing about trying to buy only Fair Trade chocolate, and so this is the perfect solution for me. You can buy different shaped silicon moulds to fill with the chocolate of your choice. This is also a good way to use up left-over Hallowe'en treats, and then you won't need to feel guilty about buying yet more sweeties. Of course, there are other ideas that aren't food-based: buy a toy that you can take apart (like Lego) and hide a different bit of it every day, or hide Christmas decorations and take it in turns to hang them on the tree. The possibilities are limited only by your imagination and budget. If you don't have time to make your own calendar, but feel a bit guilty about buying a new one, then why not buy a charity calendar? Most of the big charities produce Christmas cards which support their work, but some now also produce advent calendars. If you are absolutely desperate for a chocolate fix (and who isn't?) the Fair Trade online shop sells one. They also have a lovely wooden advent calendar that you can fill with your own items. If you don't feel like sewing it yourself you can buy a material one on sites like Etsy, or in local shops, and then fill it with your own goodies. Last year my two daughters had calendars from Usborne Books that they could colour in themelves. It depicted a street scene illustrated in a style reminiscent of traditional German Christmas markets, with more festive pictures to colour hidden behind each window. They did a little bit every day, and they're going to get them out this year and keep on colouring. You could take it one step further and create your own Christmas scene. I'd suggest buying a roll of lining paper from a wallpaper shop - this is the best paper I've found for making murals. Every day one of the family can add a bit to the picture. If you have very young children, you could sketch out the picture in advance, and then every day one of the family could colour in a bit of the picture. So, there it is: 5 ideas for different advent calenders this Christmas. Do you have any other ideas? Please share them on the comments page. One idea is to make a sort of board game that comes with 24 pieces. The board can be the calendar, and then you open up a playing piece each day, so on Christmas you have the full board game to play around the table. Lovely. I'm with you and over commercial expensive Christmas. Some great ideas here. I'm with you, the cheap chocolate ones are a waste and put the focus more on a licensed character rather than Christmas. Thanks for the great ideas, we have a re-usable calendar but I think it will be fun to make some new ones with the kids. My 1 year old grandson has not been introduced to chocolate, yet, so I hung 24 wrapped little toys, novelties, stationery, kitchen gadgets etc and hung them on a cheap, portable, plastic clothes airers with pegs for him and his mum and dad. We filled 24 match boxes with tiny treasures and put them together into a miniature chest of drawers - they're pretty cute and very popular with the kids. I love these ideas but I'm so bad with the 'one thing a night' aspect of advent calendars. Usually everything's gone by the 5th!